Castings Services has been involved in the telecommunications market for many years, having originally been involved with the supply of BT manhole covers in the 1980’s. With the subsequent introduction of cable television in the 1990’s we became a key supplier of carriageway covers and footway covers to the likes of Nynex, Cable and Wireless, NTL and Mercury. This long standing pedigree, and our commitment to quality, means that many of the current day network providers such as Virgin Media (CATV), GTT and Vodafone entrust with designing and sourcing specialist access covers for use on their underground networks. 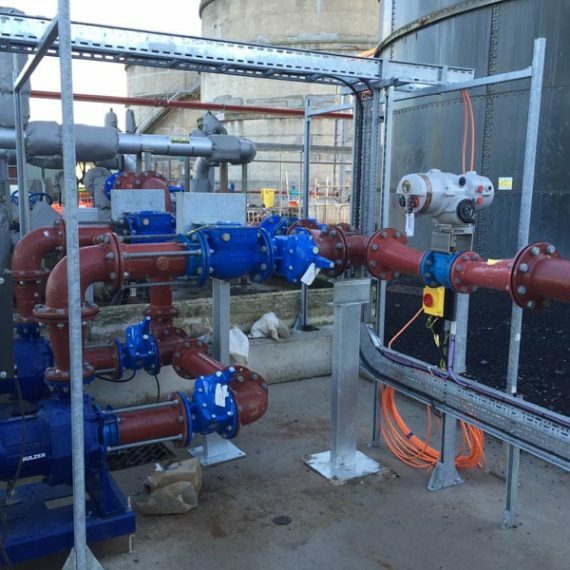 We work closely with contractors and network providers to offer bespoke solutions that meet the requirements of both parties. Our ductile iron telecom carriageway covers are available in D400 and E600 loadings and are manufactured to BS EN124 and HA104 requirements. The size and loading capabilities are the only real constant when it comes to telecoms access covers as we offer a number of different optional extras to suit each networks specification e.g. embossed badges on the manhole lid to denote the network or power provider and allow engineers to easily identify their assets. The most common requirement after badging is for a hinged manhole cover to meet manual handling requirements and allow for one man operation. 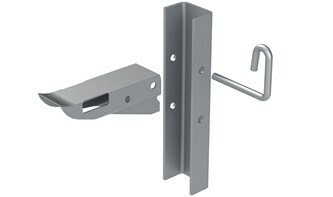 Other customers go further and request add-ons such as bespoke turnbuckle locks with unique keys to prevent unauthorised access and walk on safety grilles for fall prevention. Where there is high voltage underground cables or sensitive equipment that require an extra level of security, we can also offer security plate systems and padlockable solutions to sit below the manhole lid. These systems are very secure and are approved for use by the Ministry of Defence. Footway covers, or Driveway covers as they are sometimes known, are available in B125 loading and can be supplied as the traditional concrete filled, galvanised steel tray or, as is becoming increasing popular, as a ductile iron/galvanised steel hybrid which consists of a steel frame and ductile iron lid. As with the carriageway covers, the footway telecom covers are available with bespoke badges, locking and additional security features. The size range is extensive and varies from the carriageway range with most sizes being based on historic BT chamber sizes. However our technical sales team are always on hand to guide customers to correct network specification. Recessed covers which allow for block paving infill have traditionally been referred to as “precinct covers” as they are predominantly found in shopping precincts and town centre developments. Simply put, they are galvanised steel manhole covers with recessed lids; they can be fabricated to any size or depth to suit the size of the block paving or the network provider’s specification. 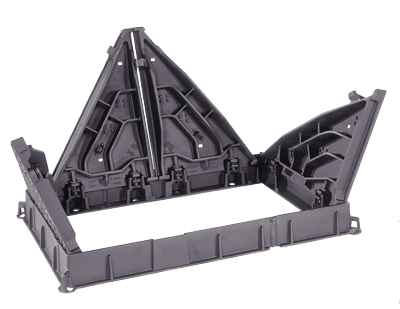 For example, BT precinct covers are only available at shallow depths to meet manual handling requirements. As with all other telecom covers, we are able to mark block paving covers so that the provider or service is easily identifiable. 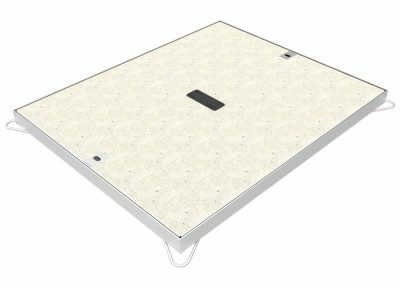 Often referred to as Gatic or Ermatic access covers these multipart manhole covers can be assembled to suit any size of access chamber and weight loading from B125 to F900. They are more commonly used on airports and water treatment works to cover large pump chambers or lighting ducts. However, on occasion, we do offer these covers for use on Telecommunications and power distribution projects when there are large below ground data exchanges or drawpits. 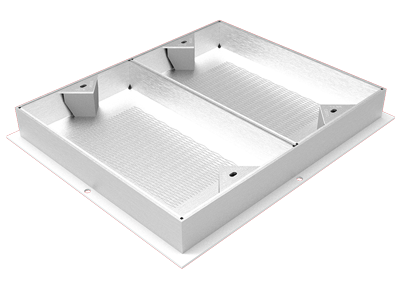 The covers are available in solid top or recessed for concrete infill and can be assembled to cover standard access chambers or in a linear fashion as duct covers. Each lid is individually machined after casting to such a close tolerance that the covers are gas, air and water tight and can only be opened with special seal breaking manhole cover keys. There are also a number of additional features and accessories that can be incorporated in to these covers such as walk on safety grids and spring or gas assistance struts to assist with the manual handling. The various cable bearer brackets, foundation bolts, step irons and sump gratings are collectively referred to as box furniture. The cable bearer bars and brackets fix to the chamber walls and support the cables as they pass through the chamber, the sump gratings allow water to drain out of the chamber and the steps allow for man access. We keep a large selection of each item which can be retrofitted to the chamber or, as mentioned above, we can supply chambers complete with cable management already fitted. We offer two types of chamber to accompany our range of telecom covers; modular plastic chambers and precast concrete chambers. 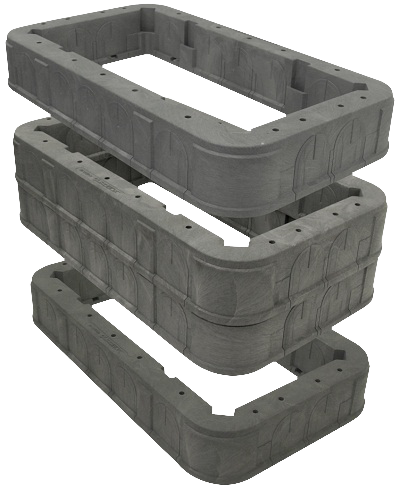 Each has it’s advantages depending on the project requirements for example, modular plastic chambers are ideal for footway chambers on long runs of duct because they are lightweight and easy for the cable gangs to handle whereas precast concrete chambers are more suitable to carriageway applications where added strength is needed. For modular plastic chambers we work with Cubis Industries to offer the market leading Stakkabox range which incorporates the Quadbox, Fortress and Ultima access chambers. Each product in the Cubis access chamber range has it owns advantages and key features which the different network providers have built in to their specifications so for example, the only BT approved access chamber is the Quadbox whereas Virgin Media access chambers also include the MONObox. Our sales team are fully aware of each network providers specification so can guide customers accordingly. Carriageway access chambers can be made from plastic and achieve E600 loading however, some clients still insist on concrete highway access chambers being used in fast moving and heavy load bearing environments. Our partnership with Kijlstra means we are able offer precast concrete chambers and manhole cover slabs to meet with any weight loading up to and including F900. 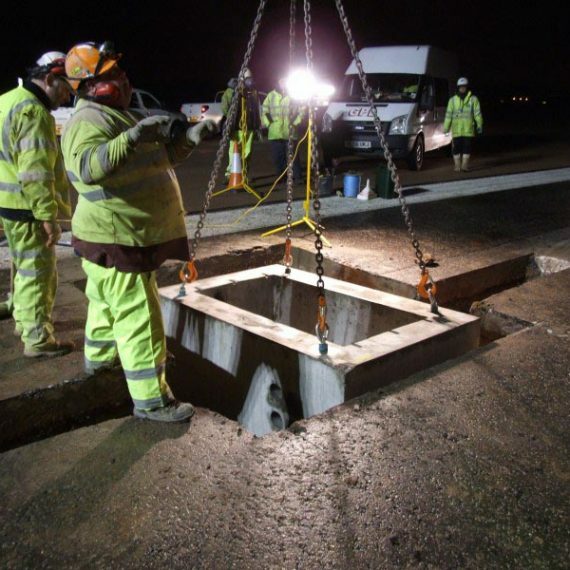 Concrete chambers are cast off site and we can deliver a complete preassembled chamber straight to site complete with cable management furniture and the relevant manhole cover already cast in to the cover slab. The contractor then just has to lower the manhole system in to place.